Nepali schools are poor. Classes are usually between 50 and 120 children, and not all have teachers. Most schools don’t have enough classrooms. Find out more about Nepali schools. 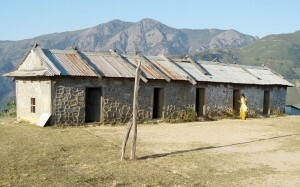 Himalayan Learning has so far built two schools, Jaladevi in the mountains, and Surya Kiran in a valley. We know that donating big gifts makes communities reliant on charity. So we only ever help with materials – the communities must build the schools themselves. We invest time and money together so we get the best, most long lasting result. Some of the schools we work with do not have have enough classrooms – children sit outside in a makeshift classroom under a tree. Others have more classrooms than teachers, so teachers have to run between classrooms, setting work to do. Classrooms are poor. Windows have no glass – they are freezing cold in winter and boiling hot in the summer. There are usually not enough chairs to go around, and it’s normal to find 10 children to a desk. Despite these apparent problems, the majority of Nepali parents still realise that educating their children is one of the only ways that they can escape the effects of extreme poverty.